Andrea's World Reviews: Diet-To-Go 20 Day Sweepstakes!!! For those of you that remember my Diet-To-Go review fro a few months back, you are probably still drooling over the incredible food that I showed you, and rightly so. Pictures do not even come close to capturing the beauty and of course the incredible deliciousness of Diet-To-Go meals, but here is a little "taste" for those who missed it before. Those are just a few of the amazing gourmet meals I enjoyed on Diet-To-Go. If you would like the chance to win an entire MONTH of FREE Diet-To-Go meals, or one of 5 runner up prizes of a FREE week of meals, then you need to enter the Diet-To-Go 20 Day Facebook Sweepstakes. For Official Rules, Click Here. 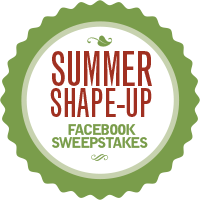 For More information on the Diet-To-Go Summer Shape-Up, Click Here. Good luck(but not too much, because I want to win, lol). And Stay tuned, because I will be posting another review soon, complete with tons of new drool worthy meal pictures.